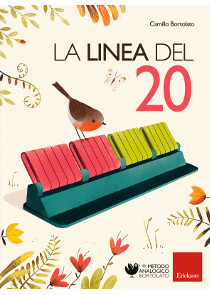 La linea del 20 – in its new, improved and coloured illustrated edition – is the alternative to coloured rods in primary school Maths teaching and also in the preparation steps at Kindergarten. The method valorises the intuitive skills of children who, according to recent research, are all born with an innate capacity for calculus and enter school with a lot of enthusiasm and information on numbers. Unlike coloured rods, which require lengthy instructions, The Line of 20 is a fun and easy method that can be used immediately. It allows arithmetic operations within the number twenty and shows that these arithmetic operations are first of all simple and daily actions such as adding and taking away. Students use the tool as an extension of their own hands and as mental calculus in human beings has evolved through the use of hands, no other explanation is required. The volume contains a complete syllabus for 1st class Maths including calculus and arithmetic problems, all presented according to the analogical approach. A separate 16-page instruction guide for parents or teachers goes with the main book and the tool. The Line of 20 is designed for students with difficulties in mental calculus, but has proven very helpful also with partially sighted or hearing impaired persons, and also with foreign students. It can also be a wonderful aid for parents who want to teach their children maths before their actual entry to school. A new edition of the tool that has revolutionized the teaching of mathematics in Italian primary schools! It is not a new invention, but the reintroduction of the natural way of learning. It is a revolution towards simplicity, because it starts from the intuitive abilities of each child who comes to school full of information about numbers and the desire to learn. The Line of 20 represents our hands, which have always been the fundamental tool for performing mental calculations. In this new edition, the numbers printed on each peg of the tool have been substituted with a separate, removable strip with the numbers 1-20 that can be located under the pegs. This strip can be removed early on so as not to disturb the perception of quantities during the calculation process. Peg number 11 has a tactile warning device in order to be used with blind children. The book that presents the program to be carried out day by day with the pupils is illustrated in full colors and shows the characters that belong to Pitti’s world. The instructions guide for parents and teachers is a separate 16-page book, located in the third page of the cover. The full-color book presents the program to be carried out day by day in order to achieve the skills required by the mathematics program on numbers within 20 (but also to 100 and 1000), and presents addition, subtraction, and word problems. Pattern drawings and mandalas help provide relaxation after the hard work and effort.